For what is really just a big, stone tower you'd expect the Washington Monument to be a boring thing to take photos of. But this isn't just any old tower and happens to be near some of the world's great landmarks, making for a bunch of ways and vantage points to get some interesting shots. The Washington Monument is a lot taller than anything else for miles around and anchors Washington DC's National Mall. 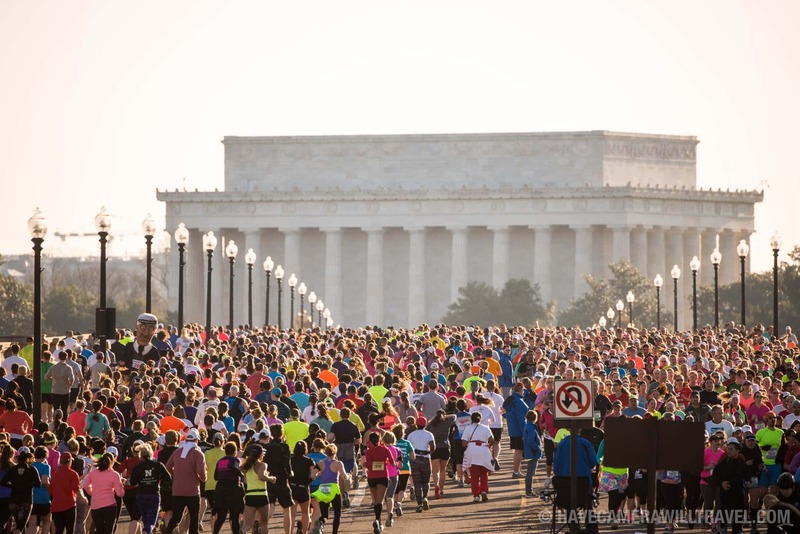 It stands on a slight hill at the intersection of lines running east-west from the US Capitol to the Lincoln Memorial and north-south from the White House to the Jefferson Memorial. 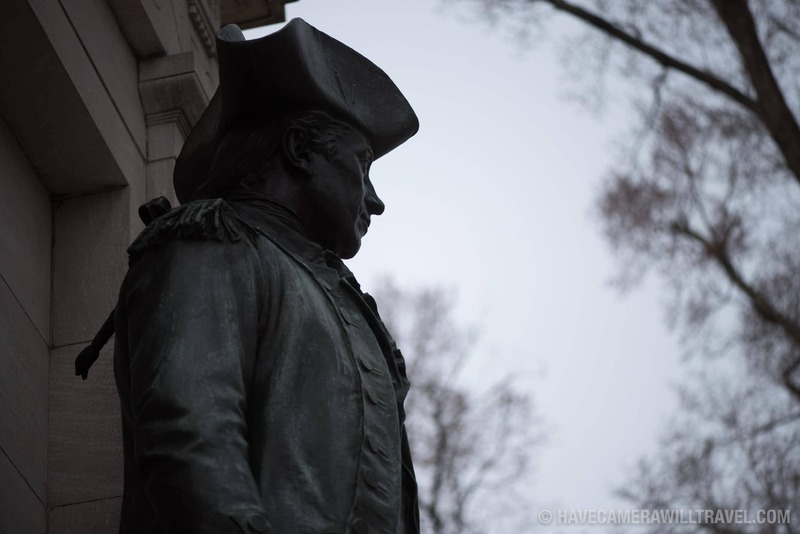 It was built in honor of George Washington, the nation's first president, and dedicated in early 1885, completing a construction process that had taken 36 years, although for half of that time construction had been halted because the funding ran out. It stands 555 feet tall and is built as a classical Egyptian obelisk. It remains the world's tallest freestanding stone structure. Its exterior is currently in good shape, having just recently gone through some renovations, and it's possible to catch the elevator to the top for some great views in all directions from 500 feet up. [See below for details.] On the elevator ride down you'll pass 195 memorial stones that are embedded on the inside walls. The easiest metro stop is the Smithsonian stop (Orange and Blue lines; 0.5 miles), but Federal Triangle (Orange and Blue lines; 0.6 miles) is also nearby. Metro has a handy Trip Planner and here's a map of the Metro lines. There's no parking right near the monument, although depending on the time of day there might be spots available along Constitution Avenue. Be sure to check the signs carefully, though, so as not to get towed. There's often free parking along Hains Point / West Potomac Park, but that's first-come-first-served, and you might end up with a long walk back to your car during the busy tourist season. UPDATE: On August 17, 2016, a malfunctioning elevator closed the tours. It will remain closed until at least spring 2019. In December 2016 it was announced that funding has been secured for repairs. The contract for the work was awarded in September 2017. They've also torn down the screening center at the base of the monument that was built as a temporary solution in 2001. They're replacing it with a stronger and more elegant permanent solution. That also means that much of the area around the base of the monument is fenced off, including the entire paved plaza area. The result is that it is not currently possible to tour inside the Washington Monument. At this point, they are not expected to resume until spring 2019 at the earliest. Now that the repairs are done (as of May 2014) from the earthquake damage, the scaffolding has come down and the Washington Monument is again open to public tours. The tickets themselves are free but if you reserve online there's a small service charge as well as a postage and handling charge if you decide to have them delivered by post (you can also do will call). Tickets are for a specific day and time. Information and links for making a reservation online are here. In summer, tickets disappear quickly, often months in advance, although even through the rest of the year it's well worth booking the tickets well in advance. Yes, there's an elevator--you're not expected to trudge up narrow, winding stairs like at some other world attractions. At the same time, although rare, it's not unheard-of for tour groups to have to walk down the 896 steps if there's an issue with the elevator. You'll pass through a security checkpoint with baggage check at the bottom. You can take your camera to the top but not large backpacks. There aren't any storage facilities on site. You can see the Washington Monument up to 30 miles away, so there's no problem finding a vantage point. Its exterior is accessible 24 hours a day year round and the structure is illuminated by heavy-duty floodlights at night. There are no restrictions on using a flash, but tripods are not allowed within the ring of flags at the monument's base. Unless you're shooting from some distance, a wide-angle lens will serve you well. But if you have a big telephoto with you, you can get some good shots of the flags with the US Capitol Dome in the background. 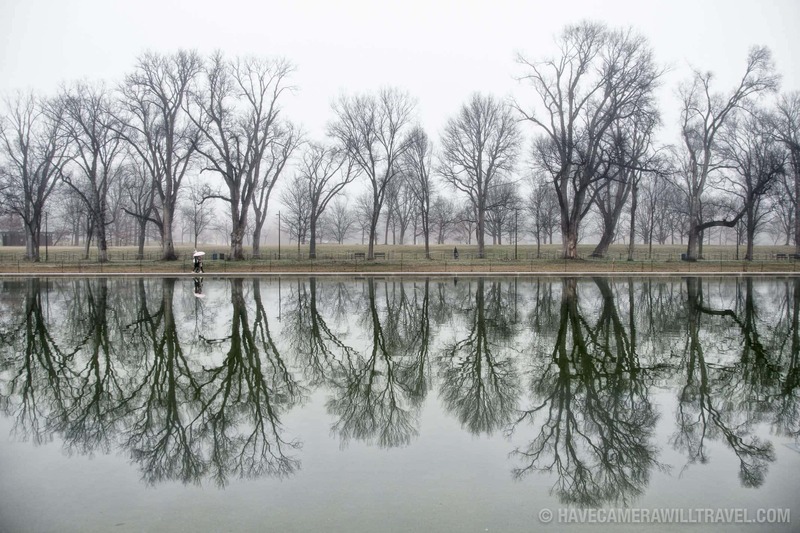 To get the Washington Monument reflected on water, head down to the Lincoln Memorial end of the Reflecting Pool or over near the FDR Memorial, across the Tidal Basin. 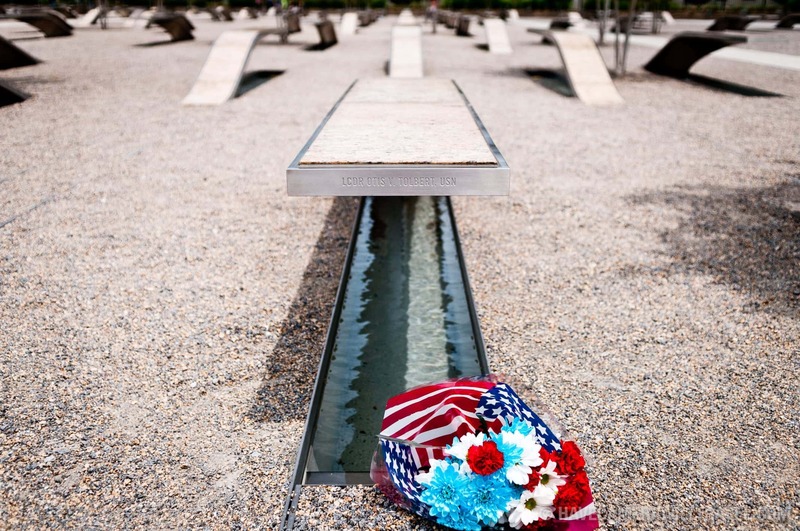 There are also good framing opportunities from the Vietnam Veterans Memorial and National World War II Memorial. 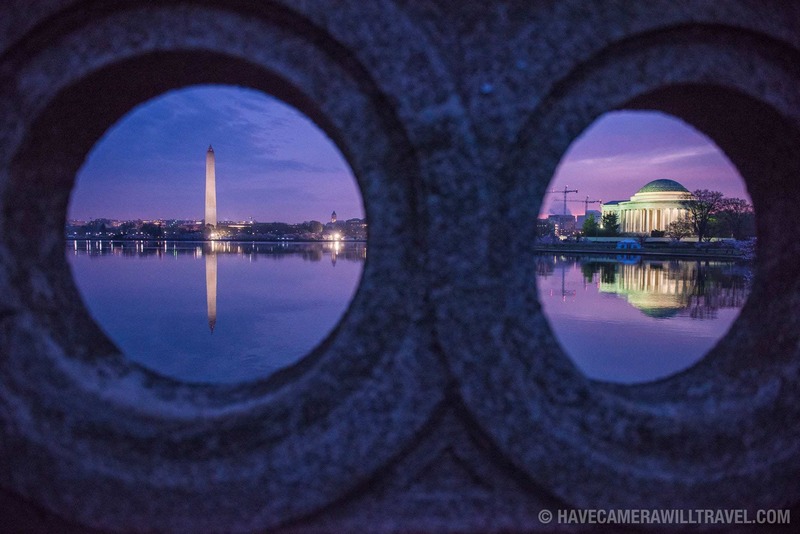 And if you want to frame it with both the Lincoln Memorial and the US Capitol Dome, head across the river to the Netherlands Carillon next to the Iwo Jima Memorial in Arlington. If you're shooting from the top of the monument when you do a tour, you'll be shooting through relatively small viewing windows of thick glass. The glass isn't as clean and clear as it could be. Putting your camera up close to the glass while using a large aperture (smaller aperture number) and focusing to infinity can help reduce the effect the scratches will have on your photos. Although the tour entries are scheduled, once you're up there you can take your time. No-one will chase you out, but it can also get cramped as new visitors arrive on the elevator. 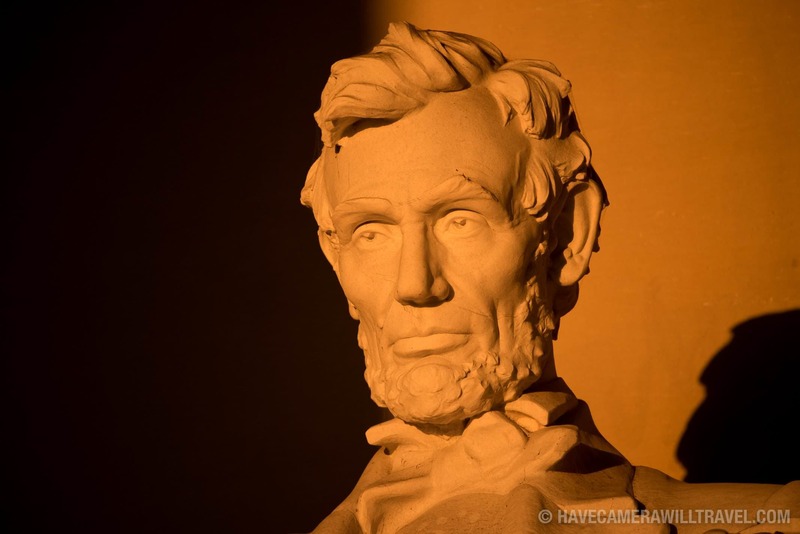 If you're taking photos of the interior of the monument--there are exhibits, exposed structural elements, and historic tribute stones--you can use a flash but not a tripod. You can find more of my photos of the Washington Monument here.